If you're in to fitness then you know that losing weight, or toning up, isn't just about exercising or going to the gym and that's it. As well as thinking about your eating habits and how you are the rest of your day movement wise, I always find that it's good to that you have items that help you along the way. I mean, I go to the gym 3 times a week and swimming once, but in between then, I can't see how well I'm doing (or not doing) and how the rest of my day effects my fitness levels. That's why I use a fitness tracker. The TomTom Touch Fitness Tracker is what I use daily to help with every aspect of my daily life and fitness. Not only does it track your steps so you can keep an eye on whether you are actually moving enough during the day, it also tracks your heart rate throughout the day, with the built-in heart rate monitor. So you can see how active you were during the day, how much you’ve been pushing yourself during training and your resting heart rate, which is a great indicator of how fit you are. It tracks your activity 24/7 - it'll capture steps, active time, calories burned, distance walked and sleep time. And it even has a sports mode which allows you to log your workouts and track your stats. You'll see how the intensity of this morning's walk compares to yesterday's run and last week's gym session. The TomTom Touch is also so simple to use. It connects to an app on my phone and can even send phone notifications to my wrist to let me know if someone is calling or texting me. I personally love that you can set goals via the app and it will track them from you. After inputting all on your height, weight etc details, you can set your very own goals - from weightloss to sports and activities - and the app will track your progress for you. For me, it shows that I'm having no-where near enough sleep on a night (thanks kids!) but that I'm surpassing my 10K daily steps and that I'm doing more than enough activities weekly to help with my weight loss goals. It's like it's showing me that I'm doing all the right things to hit my targets, or helping me to notice where I could improve. And of course, going to the gym means having the right clothing and equipment to work out with. I'm a lover of Puma and Elle fitness clothing as they just seem to have a great fit and hold me well. And when it comes to trainers, New Balance have been the comfiest for me. I wrote a post recently about staying in shape which featured these clothing for footwear. But I also think you need a good source of music because nothing makes me run faster than listening to Linkin Park whilst on the treadmill. I have Spotify on my phone and so I download my own playlist and have a mix of different genre's to keep me on my toes. I have a pair of Urbanista Boston earphones to wear whilst I run, jog or cycle and they are wireless so are perfect for wearing at the gym. 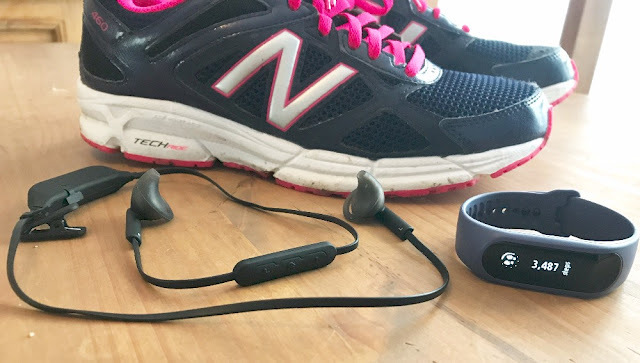 These sports earphones connect to my phone via Bluetooth and feature a combination of high quality sound and ergonomic fit, at an affordable price. Urbanista has developed a unique silicon wing (GoFit), which lets Boston sit securely in the ear, even during the most rigorous workouts - no more falling out as I run. The Boston earphones are water resistant and sweat proof, having an IPX5 water resistance rating, so that the user can train in any weather condition. For me, I love that they are wireless. Before using them I would regularly get tangled in the earphone wires and end up knocking my phone off the shelf. And nobody wants to run on the treadmill whilst trying to catch a dangling phone! Overall, when I go to the gym, or workout, I just want to know that I am doing the right thing to help achieve my goals and that I've got the right instruments for this. Perfect motivation and inspiration -hope Santa remembers to deliver my fitness tracker!! I agree that music helps but preferrably something upbeat. A useful list. I am currently on the lookout for genuinely comfortable trainers to help get me back into the gym. Ive started doing slimming world and in 8weeks I've lost 2 stone! I'm doing jogging at the minute for exercise but hoping to do a bit more. I love listening to music too, gets me in the mood, especially upbeat, fast music! I need new trainers lol. I've been good for santa so fingers crossed!